Space.com's Sarah Lewin tested out an Oculus Rift setup of the space adventure game "Elite: Dangerous" on board the U.S.S. 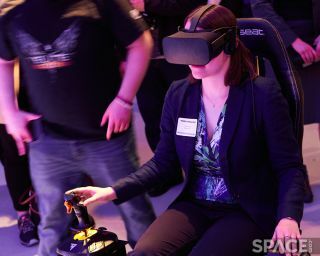 Intrepid on May 4, during a celebration of the peripheral company Thrustmaster's 25th anniversary. NEW YORK — Forget writing about space; at a gathering on the U.S.S. Intrepid in New York City this month, I got to fly through it, piloting a spaceship in virtual reality with the game "Elite: Dangerous." Peering at a vast, simulated Milky Way through the window of a three-dimensional spaceship, I was itching to zoom off and investigate the stars around me. Instead, I spun about wildly, trying to shoot targets with lasers. It's the closest I'll ever get to flying between the stars — and it was awesome. The Oculus Rift setup was surprisingly lightweight, and the cord emerging from the back didn't prove a hazard, since the ship's captain stays seated. When I got my turn at the controls, a representative of Frontier Developments, the game's creator, demonstrated how to up the thrust and how to rotate in three-dimensional space — plus, crucially, how to fire my lasers (and aim them, which the game did mostly automatically once a target was in view). Then I lifted the surprisingly light Rift headset onto my head and got a look at the spaceship's cockpit. (When I looked around behind me, the door that I presumably used to enter the cockpit was revealed.) I could see my hands on the controls — a joystick and a throttle, which players can choose to include in their control scheme, plus some pedals underfoot — and an intricate spaceport through the window in front of me. The ship filled my entire view, and I could look left or right to bring up different menus. Near my lap was a radar screen that would soon fill with indicators of where in 3D space the enemies were. But first I had to get out of the spaceport. To lift up the ship and fly it through the narrow exit was relatively straightforward, but navigation got trickier once the game pulled me to a location peppered with with enemy targets, all in sight of a wide, glowing yellow star. It took a certain level of spatial awareness, which I did not display, to match the moving radar icons to objects outside my window, turn to face them and eventually fire a weapon. The three Thrustmaster peripherals are shown on the poster behind the virtual-reality setup — a throttle, a joystick and pedals. Despite that disorientation, I didn't feel dizzy at all — surprising, because the game makes me feel queasy when I'm playing it on the computer. I felt grounded looking out the wide windows at space, and with just a bit more time I would have remembered how directions work and managed to blast more than one or two of the threats. Of course, what I really wanted to do was fly off and look at that star more carefully, or streak off elsewhere to see what the simulated Milky Way has to offer — when I talked with David Braben, Frontier's founder and CEO, in December, he described how the game's simulation offers an astronomically accurate and infinitely fascinating 400-billion-star galaxy to navigate. Newly-released game content, called Horizons, lets players land on the generated planets and moons, too. But alas, the short demo was over and it was time to head back to the real world. And what more fitting place to put down my controls than on the Intrepid Sea, Air & Space Museum, home of the space shuttle Enterprise?